Soft cover, 126 pages, full and glorious colour every single page. French. My copy purchased from Barbara Fay, Germany for 25 Euros. Not to be confused with Cluny de Brioude by Mick Fouriscot and Odette Arpin, published a few years earlier, which is mainly mats and edges. 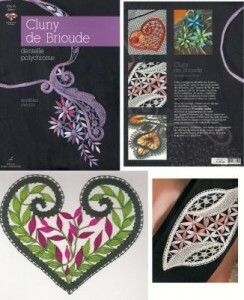 This new book is a treasure trove of motifs, jewellery and a few small mats. The diagrams in the introduction are large and clear, so are the working diagrams for each item. With Christmas just around the corner, I would recommend every Gumnut puts this at the top of their wish list for a Christmas present. It inspires even me (who does not get on very well with leaves, they don’t like me) to try something from this book – trouble is, which pattern!